Target:BP is an AHA program focused on managing high blood pressure throughout communities. It was launched in response to a growing body of evidence that shows high blood pressure is a contributing factor to many major health conditions, such as heart attack, heart failure, stroke and kidney failure. MNPS hopes that by working toward blood pressure control, it can prevent progression to other serious threats to heart health and improve long-term outcomes for MNPS employees. MNPS achieved Gold-level recognition because 70% of patients at Vanderbilt Health at MNPS Employee & Family Health Care Centers diagnosed with high blood pressure achieved their goal blood pressure. We care about our employees and want them to be as healthy as possible to enjoy everything in life. We know that healthy, engaged employees are more productive, with lower absenteeism and lower healthcare costs. The AHA Workplace Health Achievement Index assesses the culture, structure and health outcomes of organizations’ workplace health programs. The Index uses science-based and evidence-informed measures to score and recognize organizations’ workplace health. MNPS received national recognition in Forbes magazine. Only 15 percent of organizations participating in the 2017-2018 cycle received Gold-level recognition. The Cigna Well-Being Award® acknowledges that well-being programs are really about a culture shift. Wellness is a business philosophy of success that far exceeds any one individual or organization. The common link between our 2017 award recipients? They’re all inspired by the well-being movement. Learn more about the Cigna Well Being Award. 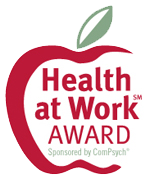 Metro Nashville Public Schools has been name a Silver winner of the 14th Annual Health at Work Awards sponsored by ComPsych, honoring organizations that promote employee health and wellness. Winners were selected based on their wellness program’s comprehensiveness, delivery, promotion, participation rates and results achieved. ComPsych Corporation is the world’s largest provider of employee assistance programs and is the pioneer and worldwide leader of fully integrated EAP, behavioral health, wellness, work-life, HR, FMLA and absence management services under its GuidanceResources brand.